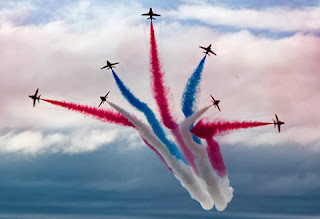 Home / british / entertainment / Fancy a ticket to the best spot to see the Red Arrows? Fancy a ticket to the best spot to see the Red Arrows? As blogged about previously, the Red Arrows are coming to town next week (Wednesday 13th November). The display is sponsored by UK Trade & Investment, BAE Systems, and the InterCon. Which means, that the best spot to see the display will be from the gardens at the InterCon. All you need to do is email this address and ask if there are any free tickets left. Was so looking forward to this but can't make it due to the ridiculous timing of this event! Why is it not on the weekend!?! In fairness, the timings are dictated by the aviation authorities and the armed forces. This is the only time it could happen. The event in the Gardens is now FULL, but the display can still be seen from further down the beach. This was so badly organised, the tickets you mention above when received on email were not numbered so I suspect people printed off more and that is why the intercon parking and gardens were so full so quickly. The intercon staff were totally unable to cope with the situation, traffic police arrived far too late to help the traffic and parking situation in the surrounding area and non were present when everyone was leaving. Another example of poor planning and execution of what should be a prestigious and fun event for everyone to watch not a hellish stressful driving and parking nightmare. Thought the event was excellent. Arrived early as advised and had no problems. Very cheap refreshments, free water. Plus the pilots stayed and signed autographs for over an hour and a half. A great day all round! I had a great time, the traffic problem, you'd have to be stupid to think that there wouldn't have been one! thanks sythe for the info..we could watch from intercon...btw no one checked for the tickets..people just walked in.. Frankly I can't see how people can possibly complain about a family friendly FREE event being held for the public, especially in a city charging 25 OMR for the visit of Barney the Dinosaur. Sadly there will always be people complaining which is why there is now such a reluctance to host events for the public like this anymore. Personnally, me and my family had a brilliant day. Thanks to the Red Arrows, Intercon and the Embassy for all the effort. What a great event, makes you proud to British, we had a great time! Muscat is rarely free of traffic problems on a normal day, I agree with Sythe; you would be stupid to think that there wouldn't be chaos. Kind of the Intercon to let everyone in, provide water and cheap refreshments, thank you to the Embassy for organising a great FREE event, sadly you can never please everyone...!